Memorial Day was yesterday and I spent most of the day traveling home from a trip meeting with some missionaries. That left me with so little time to reflect on the true meaning of the day. However, as I did so today I thought of my grandfather, Wayne Thomas Mullins, a member of the Navy who served in World War II. And while I'm thankful for what he did for my country and my freedoms, I'm beyond grateful for what he taught me and who he helped me become. A couple months ago I lost Papaw, as I called him. I was recently downloading pictures from my camera and ran across some that would turn out to be the last ones I ever took of him. While my heart was heavy to lose him, I knew where he was going, so there was a great deal of rejoicing as he was laid to rest. 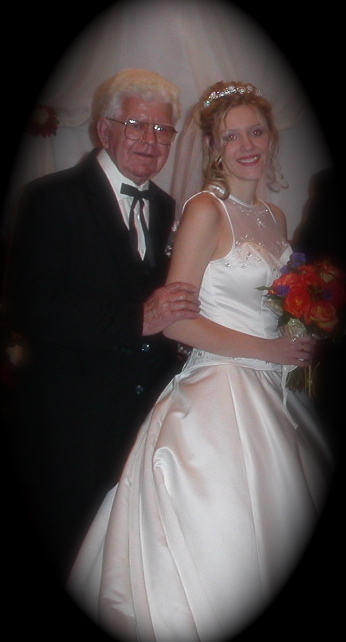 Before he passed, I had an overwhelming feeling that I was supposed to write his eulogy. I remember trying to ignore it and hoping it would go away because I was sure that would be too hard of a thing for me to do...but it never did. And when I arrived in town for the funeral, I was asked by my aunt to do what I was striving so hard not to do. However, as I began to write the words flowed from my pen like never before. With so many of my family members lost, I knew it was my duty to pick up torch he had carried for so long. So unlike most of my other posts, this one is an ode to the man who helped shape who I am. Wayne Thomas Mullins was many things to many people. To me he was my grandfather. For the past 32 years of my life, I watched one of the physically strongest men I'd ever known become one of the most feeble. As a little girl, when I fell down he would often pick me up. Now, as he neared the end, there were times when he would fall and I was the only one there to pick him up. However, there was one thing that remained constant...his faith in Jesus Christ. Growing up I remember watching him and Mamaw go to church every Sunday. Most of my life was spent living in close proximity to them. I count this a true blessing, because I was able to examine the genuineness of their faith. I wanted to know if it was real. After years of investigating, I found that it was and as a 13 year old girl, I gave my life to follow the CHRIST they served. My papaw wasn't a perfect man, but he was a godly man, who spent more hours than I've been alive, praying for his family to know the happiness he'd found in the JESUS. There was always a song rolling off his lips, a tune being hummed in his halls, a scripture spoken from his heart. No matter what the circumstance joy exuded from the very depths of his soul. The greatest lesson he taught me...how to love the SAVIOR. I'll never forget as he neared the end, he told me the one thing he wished he cold do more than anything was to go to the House of GOD. It was profound to me really and now I never take for granted the privilege I have of attending church services every time I can. It is the faith of Wayne Thomas Mullins, my grandfather, that I am choosing to carry on. It is because of Wayne Thomas Mullins, my 2 year old son can tell you all about King Josiah, a great and righteous kind of the nation of Judah. It is because of Wayne Thomas Mullins, I was able to lead my 6 year old daughter in the way of the cross and watch her give her heart to JESUS. So today I may say goodbye to the only grandfather I've ever known, but because of his faith in the CREATOR, I will be able to watch him live on in the lives of my own children. And one day, I'll meet him in the Gloryland, where once again he will lead me to Jesus and there, together, we will lay our crowns at the MASTER'S feet. If you knew him, please comment with favorite memory and if you didn't, but you know me then you now you know why I am who I am. Please join me in praying for souls of my family, so many who didn't watch and learn from a truly great man of GOD. What a beautiful post (and picture)!!! I didn't know your grandfather, but I'm sure he would be proud of you. was saved. I miss him and momma just as much now as i did when they first passed away. Im so thankful to know that i will see them again. That is one thing that helps me make it through each day. Thank you for being a wonderful granddaughter and a very special niece. I love you. Tootsie.